The field of non-destructive imaging has been well-established in various biological and medical fields but is relatively new to the agri-food sector. Its role as a quality evaluation technique for seeds is becoming increasingly recognised because it is cost-effective, offers better computation power, and is in line with the global increased interest in non-destructive examination of food items. 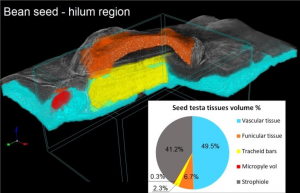 In the case of seeds, tissues with different densities and textures can be distinguished and imaged by the machine because they absorb the x-rays differently. 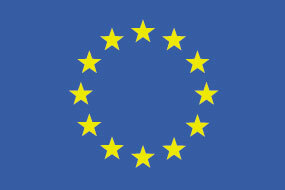 Researchers from Consiglio Nazionale delle Ricerche (CNR), a PROTEIN2FOOD partner, have been working to develop x-ray microtomography scanning protocols. This is an important step towards bridging the gap between information on genotype (genetic characteristics) and phenotype (physical characteristics) of protein-rich seeds. CNR, as a PROTEIN2FOOD partner, is responsible for developing techniques that enhance the screening of protein-rich seeds. The team has developed operative protocols for bulk sample scanning as well as single seed scanning of small and large protein-rich seeds. The outcomes from this research will allow scientists to see inside the seeds in a non-destructive way and facilitate better screening of the seeds that various PROTEIN2FOOD partners are working with. This x-ray image of a bean seed highlights the different tissues of the seed and will help scientists understand the phenotype (physical characteristics) of the crop better.